The summer months are a busy time for recycling centers. People consume more as temperatures rise and the operators at the SLV Redemption & Recycling Centers are seeing recycling volumes increase. “We’re definitely seeing more CRV (beverage containers) as well as scrap materials coming in” said Matt Harris, Site Manager at the busy Ben Lomond Transfer Station. Overall recycling volumes have declined since the recession began. “We hope the summer uptick will continue and help return our volumes to pre-recession levels” said David Wright, Director. 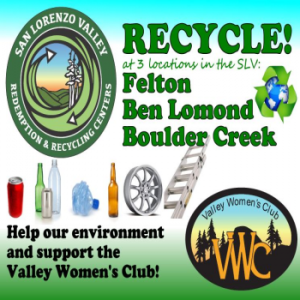 “In the meantime, we’re looking innovative ways to increase scrap materials and doing a bit of marketing to help remind people to recycle as best they can.” There are three sites in the SLV where people can recycle. The recycling centers were recently awarded another four year contract to provide recycling services to the County of Santa Cruz.